SOUTHINGTON - The 13th Annual Wing Fest is bringing the fun and flavor back to Cadillac Ranch Nov. 5, hosted by the Southington Chamber of Commerce. Wing Fest will be held from 5:30 to 8:30 p.m. at Cadillac Ranch at 45 Jude Lane. Participants will get the opportunity to sample wings from local and area restaurants and cast their vote for best overall wings, best hot wing and best wacky wing. The event will also feature a live DJ for entertainment. Restaurants that are confirmed include Chili’s, Groggy Frogg, Cadillac Ranch and returning restaurants Buffalo Wild Wings and Castello. Taylor Crofton, executive director of the Southington Chamber of Commerce, said that last year there were nine vendors and she is hoping to get at least that many this year. Last year, Southington Bread for Life also participated in the Wing Fest as a fundraiser. 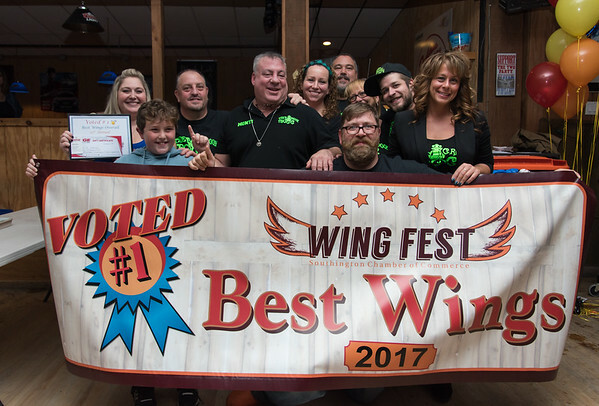 Groggy Frogg won best overall wings in 2017 with Tavern 42 as runner up. Hottest wing was also claimed by Groggy Frogg and their “FU Hot” wing, with Tipping Chair as runner up. Tipping Chair was also voted most original wings with their friend dough wings and Groggy Frogg was also a runner up in that category. Last year was also late former Groggy Frogg owner Mike Montana’s last year at Wing Fest before he died in May. However, the gastropub has remained open and is eager to compete. Crofton encouraged people to come down to Cadillac Ranch and dig in. The Southington Chamber of Commerce will also be selling Southington branded hoodies, hats and coffee mugs. Tickets are $13 in advance online or at the chamber office. Tickets at the door are $15 for adults and $5 for kids 8 and under. The chamber will also offer special group rates for those who call. To purchase tickets, or to sign-up as a vendor, call the Chamber office at 860-628-8036. Posted in New Britain Herald, General News, Southington Herald on Wednesday, 31 October 2018 19:55. Updated: Wednesday, 31 October 2018 19:58.